This entry was posted in Quilt kit, Quilt Pattern, Quilting, Quilts: Pieced and tagged Flannel Quilt Kit, Flying Geese, Free Quilt Pattern, Handcock Paducah, Quilt kit, Wendy Sheppard Designs, Windham Fabrics, Windham Fabrics Newport. Bookmark the permalink. Miss Baby is so talented!I love her painting-good job! Beautiful “wintery, snuggly” quilt. The pattern really shows off the beautiful fabrics. Miss Baby is quite the artist. I think that you have a Picasso residing in your home. “Harmony” is almost up to date, yippee!! Aw, LOVE Ms Baby’s painting! I think she definitely has some talent there! Miss Baby seems to understand value as well las composition. Hope you frame her piece. Great job Miss Baby. What a beautiful sea turtle. Lovely quilt too! Miss Baby has an eye for color. I like the stripe you chose for the inner border. I love making Half square triangles, but have only done 1 project with flying geese, so I have not learned to love making them. What a “beeeeeuuuuuuutiful” sea turtle! Watch out….Miss Baby will be designing fabrics and quilts herself before long. I particularly love flannels….no fabric is quite so snuggly as a good flannel….even for a backing. Good luck on your week’s “to-do” list….I’m still trying to learn the secret to “catching up”. Any wisdom you have to share would be appreciated…. :) ….blessings…. What a spectacular painting by Miss Baby! Glad that you shared it! Your quilt pattern is very pretty. If and when I ever get caught up with every quilt project I am working on this summer, this would be the perfect quilt to make! 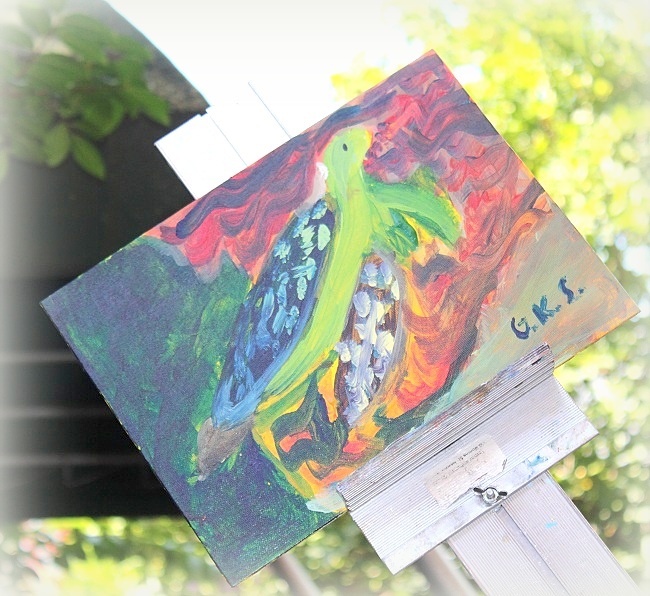 Thank you for sharing and have a fantastic creative day! Wow! I Loved Miss Baby’s Painting. For her age she has many talents. Wow #2! 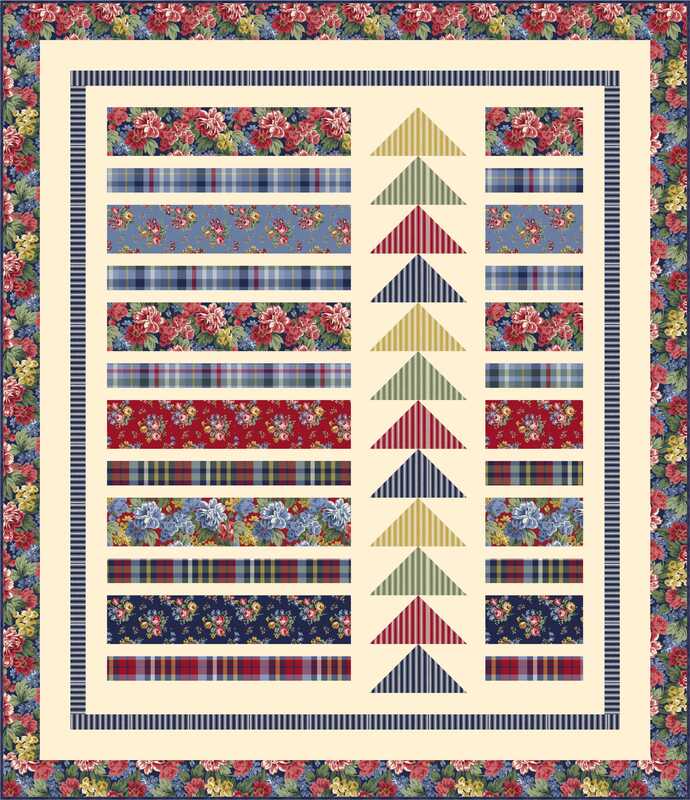 Totally loved the Windham Flannel Quilt that you made! It is eye candy. Fun painting by Miss Baby. How fun to go to art camp! That pattern is a great way to show off the fabrics and I’ll bet it is super soft in flannel. Love the geese too. I’d saw that there is a second artist in the family. Love the use of color and that’s a perfect turtle. Is it going to be framed now???? Art camp sounds like so much fun! Wish they’d had things like that when I was a kid! I hope you frame Miss Baby’s picture–she is talented!!! I really like your pattern, and flying geese are a favorite of mine as well. I have never used flannels in a quilt… just my winter p.j.s. Those are beautiful fabrics. I adore this pattern and can’t wait to make it!! !